Building a trail in the native grass meadow. 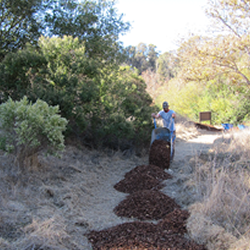 Last year, the Vallejo Watershed Alliance successfully built a new trail in Hanns Park so that third graders on their Watershed Explorer field trips could stay focused and reduce damage to the native plants. The path worked brilliantly, and now needs to be refreshed for the upcoming season. We’ll meet in Hanns Park (entrance lot is on Skyline off Redwood Parkway). Wear comfortable clothes, sturdy shoes, hat, sunscreen, and gloves. We’ll bring water, refreshments, and tools. Join us hundreds of Vallejo volunteers for this year’s Coastal Cleanup Day on Saturday, September 20 from 9 a.m. to noon. The Vallejo Watershed Alliance will be cleaning Rindler Creek (Fairgrounds Drive at Coach Lane), but there are other sites available as well; call (707) 645-8258 to find your site today!